Wait, it’s not fall yet, is it? Well, it sure is starting to feel like fall around here, and to celebrate… homemade coconut maple granola filled my kitchen with delicious smells this morning! It’s cloudy outside and I’m ready for boots and sweaters and scarves, and all things pumpkin… mmm, I love fall! 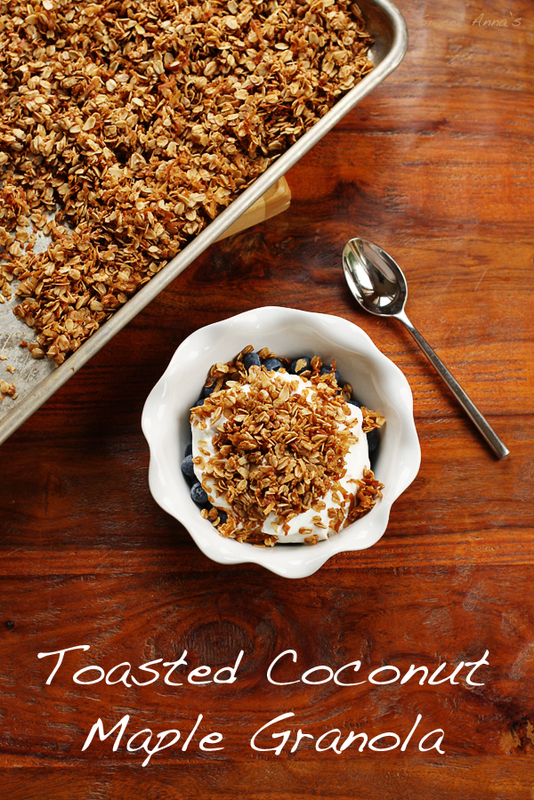 Have you ever made homemade granola before? Because the store-bought stuff really just doesn’t even compare. I like my granola simple, lots of oats, some coconut, maybe some nuts, but if you like yours full of other things, feel free to substitute out some of the oats for whatever you’d like! Whatever you do, get busy making some granola. At this end of the summer season, there really is nothing better than a big bowl of fresh blueberries or peaches topped with plain yogurt and a generous sprinkling of homemade granola. Let’s celebrate summer out with a bang! In a large bowl, stir together the oats, coconut, brown sugar, cinnamon, nutmeg and salt until well mixed. In a small saucepan, melt together the coconut oil and the maple syrup. Remove from the heat and stir in the maple flavor, if you are using it, and then pour the maple syrup mixture all over the oat mixture, stirring well, even using your hands, to make sure everything is well coated. Spread this mixture out onto a large rimmed baking sheet and bake for 45-60 minutes, until the oats are golden brown, stirring every 20 minutes. Let cool completely (breaking it up a few times as it cools) before storing in an airtight container for up to 2 weeks!